Today our group has published the experimental evidence of Majorana particles in semiconductor nanowires. Here I explain our findings in the broadest possible context. What are the Majoranas, how to make them and what are they good for. Physicists are in the business of figuring out the machinery that runs our world. When you zoom in deep enough you find that everything is made of tiny particles. We call them elementary particles, because they cannot be broken down into even smaller particles. They are the true building blocks of the Universe. As of 2012 we can be quite certain that we still do not know all the particles that make up our reality. For example, our most basic theory of matter, called the Standard Model, predicts the Higgs boson, which is still a missing tile in the puzzle. The discovery of the Higgs boson would explain why objects have mass. So Higgs is of profound importance in fundamental physics. Here is a more practical example of astronomical proportions: we know for sure that there is a lot of stuff in the Universe (70%) that is completely unidentified. We call it ‘dark matter’ because we have no clue what it is. But we are free to guess, and some physicists think that dark matter is zillions of mysterious Majorana fermions. What are the Majorana fermions? The story begins with Paul Dirac, a British physicist who managed to combine in one equation two greatest developments of modern physics — Einstein’s Theory of Relativity and Quantum Mechanics. Dirac’s equation showed that along with matter there exists anti-matter. All properties of anti-matter are completely opposite to ordinary matter. It is as if you went through the looking glass with Lewis Carroll’sAlice. For example, an electron has a negative charge, but a positron has a positive charge, because it is the anti-particle of an electron. A young Italian theoretician Ettore Majorana took this idea and thought about it. In 1930’s he was able to prove that there can be a particle living right on the boundary between matter and anti-matter, on the surface of a looking-glass. A notion of a Majorana fermion was born, a particle that is also its own antiparticle. 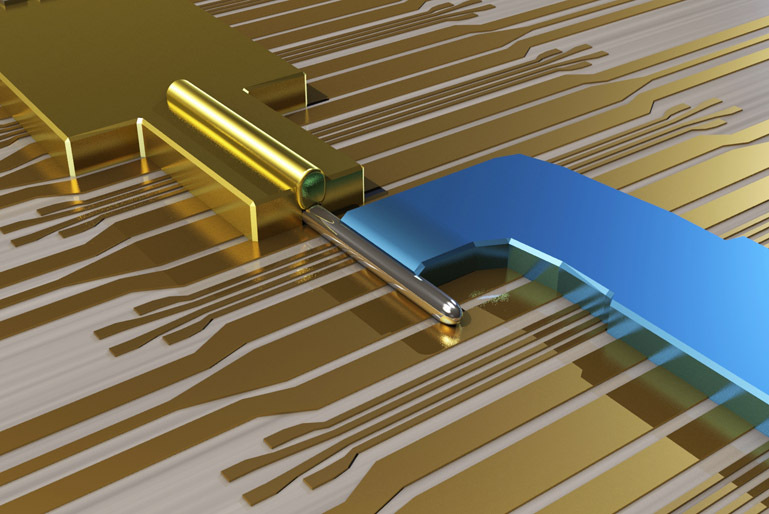 Seventy five years passed, and Majorana fermions remained just an idea. Researchers tried to find them in large particle accelerators and in massive underground neutrino detectors. Then, a new way of thinking arrived. If we cannot catch a Majorana, perhaps we can build one? We would use other particles, for example electrons, and combine them into a quasi-particle. Here ‘quasi’ means that electrons would behave together like one particle, but it would not be an elementary particle. Theorists provided us with a simple recipe for how to cook a Majorana in the lab. You take a semiconductor and a superconductor, and connect them together. Then you cool this hybrid down to almost absolute zero temperature (-273 degrees C) and turn on the magnetic field. This provides just the right cocktail of interactions between electrons, and they collectively form Majoranas. If you follow the recipe, the Majorana quasiparticles would appear on the edges of a semiconductor. In our lab in Delft we have gathered all the ingredients for the recipe. We started from indium antimonide nanowires grown at Eindhoven University of Technology. Nanowires are cylinders of semiconductor few millionths of a meter in length and a few millionths of a centimeter in diameter. We covered the nanowire with a superconducting niobium alloy, and cooled this nano-scale device in strong magnetic field. The next puzzle was how to tell if Majoranas were there. Normally physicists discover new particles in colliders, where beams of protons collide, and detectors analyze the scattered beams for traces of new particles. Our devices work in a similar way. In fact they are nano-colliders. We send a beam of electrons along the nanowire towards the Majorana fermion. At the same time we detect the current of electrons scattered off the Majorana fermion. As a signature of Majoranas, we observe a peak in the current at zero-energy — this is where the boundary between matter and anti-matter lies! We have therefore found a way to obtain Majorana fermions, the objects predicted by Ettore Majorana using the Dirac’s equation. However, quasiparticles generated in our experiments are not elementary particles, because they are made of electrons. This means they are not the building blocks of the Universe. But, as it turns out, they can be the building blocks for a future generation of computers. In fact, Majorana quasiparticles can be used as quantum bits in a topological quantum computer, which is a fascinating new way of computing. Topological quantum computation will be performed by moving Majorana particles around each other in a quantum dance, which is nick-named ‘braiding’. A device that we had to build to generate and detect Majoranas is basically a transistor, the essential element in modern day computer chips. The next step will be to re-design this Majorana transistor into an electronic chip with multiple Majoranas, similar to the computer processors of today. Work on the braiding experiment has already started in Delft. We hope it will bring new fundamental physics knowledge, and that a new paradigm of quantum electronics will emerge for the benefit of society. Paper available on Science Express , and on arxiv.org . Next Post Share your data! – when you say mass (the discovery of the Higgs boson would explain why objects have mass), what do you mean by that?? – the peak in current at zero energy thingy, how is it different from superconductors?? Hi Lan, yes it is on arxiv. To answer your questions – somehow Higgs particle curves the space-time lines which is a fancy way of saying that objects get mass. This is why it is so important to look for Higgs. And indeed, a peak in conductance can come from many different effect, this is why we ran many tests. You are perfectly capable of reading the paper – it is very experimental! In fact, you are among the most qualified people to judge it.